Wolf Commercial Real Estate, a leading Southern New Jersey commercial real estate broker with expertise in South Jersey commercial real estate listings and services, now has available highly visible South Jersey industrial space for sale or lease at 7 Atlantic Avenue Lawnside NJ. This South Jersey building for sale or lease is a +/- 3,840 square-foot building. This Southern New Jersey industrial space for sale or lease is a fully operational car dealership. 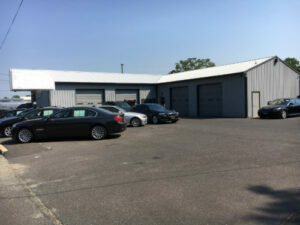 There also is a used car deal license available for this South Jersey industrial building for sale or lease. Additionally, this South Jersey industrial space for lease or sale has a financing license from the state of NJ. The asking sale price for this industrial space in South Jersey is $459,000. The asking lease price for this industrial space in South Jersey is $2,800/month plus utilities, snow removal and landscaping. This South Jersey industrial space for sale or lease at 7 Atlantic Avenue Lawnside NJ is available for immediate occupancy through Wolf Commercial Real Estate, a Southern New Jersey commercial real estate brokerage firm that specializes in South Jersey commercial real estate listings and services. This South Jersey building for sale or lease contains offices and there is a four-plus bay garage at this industrial space in South Jersey. This South Jersey industrial building for sale or lease is a great opportunity to purchase a property with all necessary business licenses. The owner of this South Jersey industrial space for lease or sale is relocating. Situated on +/- .36 acres, this industrial space in South Jersey at 7 Atlantic Avenue Lawnside NJ is within easy access to the NJ Turnpike and I-295. Monument signage is available at this South Jersey building for sale or lease. More than 283,000 people reside within a five-mile radius of this industrial space in South Jersey at 7 Atlantic Avenue Lawnside NJ. The average household income in the same area near this Southern New Jersey industrial space for sale or lease is $81,238. For more information about this South Jersey industrial space for sale or lease at 7 Atlantic Avenue Lawnside NJ or about any other South Jersey commercial properties for sale or lease, please contact Leor Hemo (856-857-6302; leor.hemo@wolfcre.com) or Jason Wolf (856-857-6301; jason.wolf@wolfcre.com) at Wolf Commercial Real Estate, a Southern New Jersey commercial real estate brokerage firm.